Mata Ortiz pottery is a kind of revival of a prehistoric pottery tradition from Casa Grandes (Paquime ruins), Mexico. But the unique story of this village of artists is one that continues with innovation rather than strict adherence to cultural tradition. 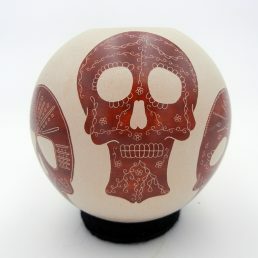 View our collection of genuine Mata Ortiz pottery! 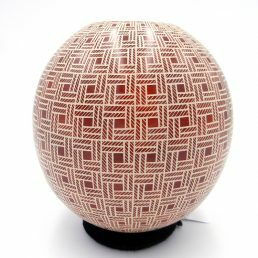 The Mata Ortiz pottery tradition is a young one. Juan Quezada, a railroad worker in Chihuahua, Mexico, first found pottery shards in the hills surrounding the Paquime ruins in 1955. 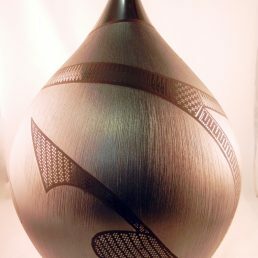 After years of trial and error, Quezada was able to reproduce the native pottery. 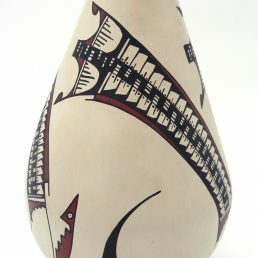 Quezada began making marketable pottery in earnest in the 1970s. 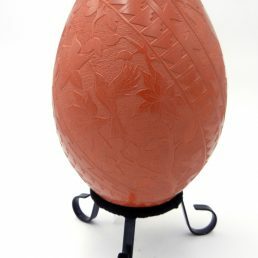 Since then, he has also taught members of his family and others in his village of Mata Ortiz the art of pottery making. Today there are over 350 artists, many of whose work is featured in the book Mata Ortiz Pottery Today by Palms Trading Company‘s owner, Guy Berger. Mata Ortiz pottery artists are not related to Native American Pueblo Indians—there is no historical migration that suggests the Paquime culture shares ancestry with the Pueblo peoples. 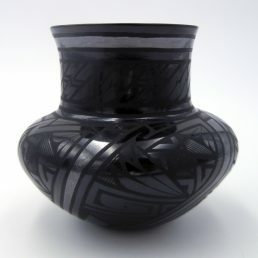 However, there are common pottery styles and designs used among the Mata Ortiz and Pueblo artists. 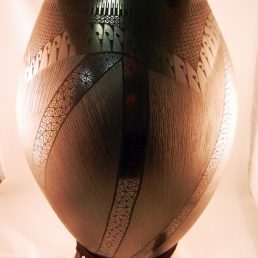 The most notable similarity between Mata Ortiz pottery and that of Native American Indians’ is the stylized bird patterns. Mata Ortiz artists commonly incorporate the design of a macaw—a bird with a rounded head that terminates in a hook-like swirl signifying a beak. 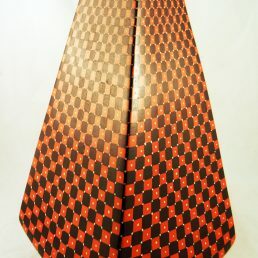 A similar bird is characteristic of Acoma Pueblo pottery, although the bird is referred to as a parrot. 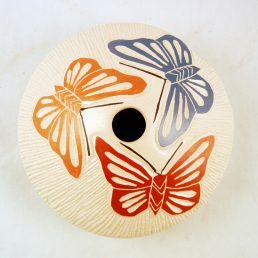 Mata Ortiz pottery artists, like Native American Indian artists, hand-coil their pieces and often fire them outdoors. 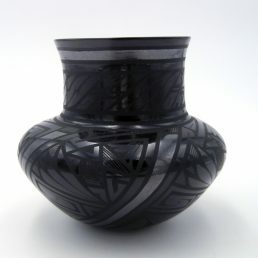 Although similar in many ways to Native American Indian pottery, Mata Ortiz pottery should not be considered a replication of Southwestern American pottery art. 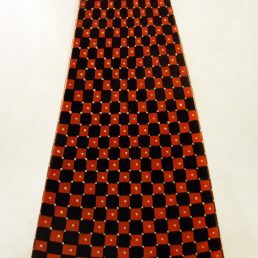 Mata Ortiz artists are skilled and creative craftspeople in their own rights. And this is evident in the innovation and evolution of Mata Ortiz pottery. Because the Mata Ortiz artists are not members of the ancient community whose pottery inspired their own tradition, these artists often experiment more freely and take more liberties with their pottery designs. This is evident in the varied and vibrant colors used by Mata Ortiz artists. Where Native American Indian artists’ palettes are often limited to earth tones—blacks, browns, reds and oranges—Mata Ortiz artists incorporate fresh greens, light blues and a crimson red into their patterns. Like each piece of Native American Indian pottery, the collection or Mata Ortiz pottery at Palms Trading Company is guaranteed authentic. Our online selection displays a range of styles and finishes mastered by Mata Ortiz artists. 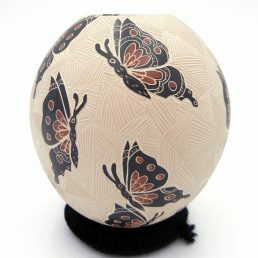 But if you’d like to see more Mata Ortiz pottery, please contact us to use our personal shopper service.